STRASBOURG, France - A day after the shocking shooting at the world renowned Strasbourg Christmas market in France, the manhunt for the suspect continued on Wednesday. In the incident that occurred at Strasbourg's Christmas market just before 8 pm on Tuesday, involved a gunman who opened fire, killing two people and leaving 12 others injured, before fleeing the scene. The entire eastern French city of Strasbourg was placed under lockdown as the police launched a massive manhunt for the suspect. The French government, which raised the security alert level following the attack, said that it had sent police reinforcements to Strasbourg late on Tuesday. On Wednesday, officials said that about 350 security forces were now searching for the assailant, while five people had been detained as part of the manhunt. The French police union officials revealed more details about the suspect, claiming that he was a suspected Islamic extremist. 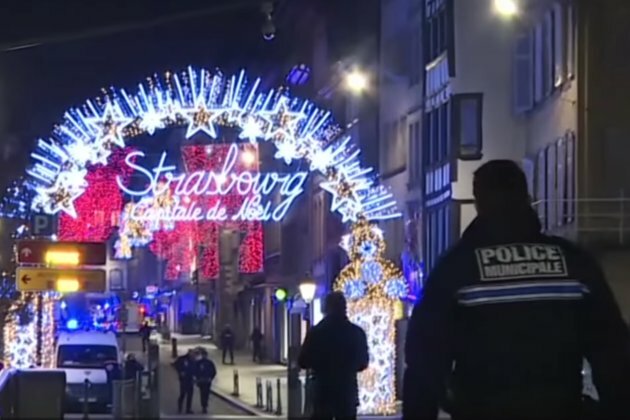 The suspect was identified as 29-year-old Cherif Chekatt, a Strasbourg resident and native who reportedly has a police record in France and Germany. According to investigators, the suspect was injured in a gunfight with soldiers after the attack on Tuesday night, but managed to escape. Investigators reportedly believe that the man might have escaped to neighboring Germany, but no official statement about the direction of the probe has been revealed so far. According to details released by officials of the French police union, the suspect Chekatt had been flagged for extremism. Speaking to reporters on Wednesday, Strasbourg Mayor Ronald Ries declared that the incident in his city, "was indisputably a terrorist attack." Separately, in an interview with France-Inter radio, Laurent Nunez, secretary of state for the Interior Ministry said that while the hunt for Chekatt continues, the police had detained five people in overnight searches around the city. Meanwhile, in a statement released to the media, Remi Heitz, the Paris prosecutor revealed that witnesses reported hearing the gunman shout 'Allahu Akbar' (Arabic: God is great) during the attack. Heitz added, "Considering the target, his way of operating, his profile and the testimonies of those who heard him yell 'Allahu Akbar,' the anti-terrorist police have been called into action." Hours after the attack on Tuesday, prosecutors said that they had launched a terrorism investigation into the shooting. So far, authorities have not confirmed the motive of the suspect, who opened fire at one of Europe's most famous Christmas markets on Tuesday night.